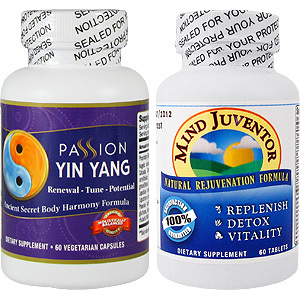 In addition, the Cuscuta, Pyrola Calliantha, Shilajit, Dong Quai, and Pfaffia Paniculata in this formula act as 5-alpha-reductase inhibitors that prevents testosterone from metabolizing into dihydro-testosterone (DHT). There are dual effects of reducing DHT and maintaining adequate testosterone in the body, as it also helps men to quickly recover from many symptoms of sexual exhaustion. By reducing the amount of glucocorticoids, this remedy can ease stress on the liver and allow a more relaxed state of being. As a result, over production of DHT is inhibited, preventing the harmful chemical from attaching itself to hair follicles, thereby promoting freer growth of hair. Fo-Ti has been used as a liver detoxification to help elevate the blood levels around thescalp. By increasing the blood flow to the scalp, Fo Ti may benefit people experiencingpremature graying or suffering from hair loss. Fo-Ti has been traditionally used in the Chinese culture to further prevent and stop the graying and loss of hair as written in the story of Me. He.Fo-Ti was also known to increase the durationof hair growth. Utilization of the potent benefits of the remedy will enable you to restore your ability to overcome premature baldness and stop current hair loss due to over masturbation. For hundreds of years, Chinese Medicinal textbooks have documented the benefits of Fo-Ti (Polygonum multiflorum), Astragalus Membraneous, Mulberry, Cuscuta, and Ginkgo Biloba; together, they promote bioenergy at the scalp to facilitate hair growth. It was only recently that scientists were able to figure out the exact molecular mechanism involved. During stressed and exhausted states, our body secretes an abnormally high amount of glucocorticoids, cortisol, and DHT. Exposure and accumulation of glucocorticoids can cause inflammation in the liver and complicate liver diseases. Formulation of this product is based on Herbal Hair Loss Treatment & Hair Follicle Regrowth. For maximum benefits take 2 tablets twice a day. I tried it and was not seeing results. I stopped taking it after 1 week. A few months later I decided to go ahead and try it again, I finished the bottle and the results were just coming in when I finished the bottle. I have already ordered a new bottle. Brianna "Great hair after 3 months"
Beauty guru "Highly recommend it!" I recently lost a lot of hair because I have been having lots of stress. I was very self conscious about this and I started looking for ways to grow my hair. I am so happy I started using this because I saw results within 2 weeks. This is really great. I have already finished my bottles and am going to order some more. The results of this are really well noticeable and I have gained my confidence once again. I have been suffering from hair loss for the past 3 years and have been trying to find something to help me. I recently found these about a month ago and I am glad that I have. They work so great. I am really happy with them. I will definitely recommend them. Trey "Hope it Works "
I have Place my Order .this is my Last Hope : I Hope it cures my hair Problem due over Masturbating now i Look like a Sick Person because im Lack of Many Vitamins .hope this medication helps. Austria "Well i dont know"
I bought a two month supply.. saw 0 results, a complete waste of money, time, and effort. Bottle also says it may contain ingredients known to cause cancer. hilton "still want to buy"
Hair Rejuvenation & Restoration Formula - is shipped in a discrete, unmarked package. Orders are processed immediately and usually takes about 3 to 5 working days to be received. We do ask that you try it for 2 to 3 weeks to feel the full effects. Any information received is used only for order processing and shipping purposes. Your information, such as e-mail address, will never be disclosed to a third party.